Many employees with some experience under their belts say they’ve had a bad work experience. Perhaps this will start to change in 2019. Both private and public organizations are now looking to transform their work environment. With this comes streamlining their hiring and onboarding processes to reinforce a healthy work culture. When employees are supported, an organization prospers in more ways than one. The reality is that a fair amount of people are not satisfied with their work environment. A 2016 Statista survey found that 43 percent of respondents believed that stress had a negative impact on their work culture. When these core management functions are accomplished successfully, however, employee satisfaction increases, stress decreases and organizations save money – sometimes lots of money. Healthy work culture improvement did not change much between 2016 and 2018. Between 2016 and 2018, employees who were not happy in their jobs left them. Turnover was high. Employees who did leave said it made no sense to stay in a job that robbed their productivity. Other organizations and competitors were more than happy to pick them up. 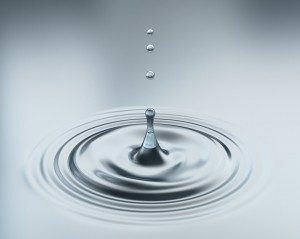 For example, another Statista survey conducted in 2017 found that 25 percent of respondents felt run down and drained of physical and emotional energy due to their workplace. That’s why it’s important to revitalize the work environment to build a healthy work culture. Through group norms of behavior that support trust, interdependence, genuineness, empathy, risk and success, it is possible to jumpstart both positive department and work culture behavior. These six principles, researched by TIGERS® Success Series, are readily visible in department behavior. For example, if any of the six principles are missing, there are predictable negative consequences. It is difficult to build high performance teams and workgroups when work culture behavior does not support productivity and instead supports conflict, misunderstandings, frustration and sweeping problems under the rug. If a healthy work culture is desired, it must be earned. It’s not something that develops overnight. Once you have an idea of how to take your company in the right direction, correcting unproductive behavior often falls into place. Why care about a healthy work culture? There are three reasons why caring about a healthy work culture and doing something about it makes sense. First, if your employees aren’t excited to come to work, then expect your productivity levels to suffer. Long story short, people resist getting things done when leaders don’t treat them with respect. Organizational behavior expert, Jeffrey Pfeffer, found that the workplace is the fifth leading cause of death in the United States, making it an effective death trap for employees. Second, and on top of modern work environments being referred to as death traps, if only unmotivated employees stay with you, productivity also suffers. An organization with low engagement is one with a profit sieve. And finally, expect talented employees to leave an unhealthy work culture. Large turnover can be expected when you don’t pay attention to building and maintaining a healthy work culture. The retention rate for a company with a healthy work culture is always going to be high. That’s why it’s imperative to nip your problems in the bud while you can. Don’t settle for high turnover. Look for those talented and engaged employees who will stay. How to prepare your company for a healthy work culture. If you desirer a healthy work culture, it starts with your managers. Employees thrive off authenticity–this includes trust, genuineness, empathy and a positive attitude toward mistakes. A boss with a poor attitude makes for an uncomfortable workplace. This is why managers must leave their personal lives at the door. Managers who are thoughtful, courageous and listen to their employees reduce talent turnover better than a management team that does not. For one reason, trust is a power tool for managers. When employees trust their managers, they can ask questions that lead to real truths. Once a truth is out there, managers must act in order to yield quick results. When words match actions over time, employees become more comfortable with their manager and the organization as whole. Managers who build trust leverage employee strengths, are patient and maintain a successful work culture through employee coaching and training designed to help employees succeed. Recently Ceridian revealed the top Human Capital Management Trends for 2019 and found that employers are looking to understand their employees better. With employee engagement, wellness and productivity, a healthy work culture can evolve. The key initiative is to get the entire workforce involved and talking about how to make the workplace more human. How humanizing the workplace maintains a healthy work culture. Maintaining a healthy work culture means that when things get busy, employees are supported. This means that human needs are met. Work is meaningful. Employees know how what they do supports the organization as a whole. Positive connections and friendships are encouraged and evolve on the job. The workplace is trustworthy. Leaders are competent, leaders and employees do what they say they are going to do, and nobody lies or covers up mistakes. Employees feel empowered to be productive and solve problems. Employees feel they belong to a community that is compatible with their values and helps them succeed. Employees receive recognition for exceptional work they perform. There is an element of service to one another. The concept, if we win, we all win, prevails. Employees are encouraged to grow personally and improve professionally. The workplace is constantly learning and working to solve problems that exacerbate employee performance. The workplace brings value to an employee’s life. 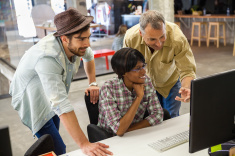 Bottom line, if you want your employees to prosper, simply humanize the workplace. What resources can help managers maintain a healthy work culture? 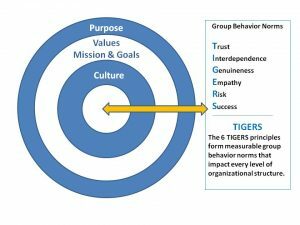 The TIGERS Success Series Workforce Behavioral Profile™ assessment is one way to monitor the levels of trust, interdependence, genuineness, empathy, risk resolution and success in work culture and department behavior. TIGERS also provides Manager As Facilitation training and TIGERS Micro Training for every employee at a low annual subscription cost. This comprehensive system, measurably improves workplace cooperation and collaboration between departments. It provides a way to measure and track your return on investment when work culture is in transition. Based on the six TIGERS principles — trust, interdependence, empathy, risk, success and genuineness — the TIGERS Workforce Behavioral Profile™ provides the intelligence needed to build teams, improve them and capitalize on your work environment improvements. This assessment gives you the long-term insight needed in order to build and maintain a healthy work culture while improving department behavior over time. A healthy work culture depends on good management, initiatives and goals that are understood and good communication skills. Yes, work can be a draining. But it’s possible to change that. Building a work environment that your employees enjoy returning to after a couple of days off ultimately depends on the communication skills and attitudes of your managers. These skills and attitudes must build trust. When trust is established through competence, coaching and training, humanizing the workplace comes much easier. This is a workplace where it is OK for employees to open up, be genuine and comfortable in their own skin. Once employees feel that way, they will be beneficial, loyal and productive workers. Care to dig deeper into this conversation about a healthy work culture? Management Jobs Are On The Rise. Are You Ready? For more information or to request a presentation to your group or association, schedule a business call. To subscribe to our complimentary newsletter, click here.